This image is an enlargement of a photograph of the Mars Odyssey probe taken by NASA's Mars Global Surveyor probe while the two spacecraft were 56 miles (90 kilometers) apart. A NASA spacecraft circling Mars hasspied, for the first time, two of its fellow probes orbiting the red planet. Red planet veteran Mars GlobalSurveyor (MGS) successfully photographed NASA's Mars Odyssey probe and theEuropean-built Mars Express spacecraft during a series of observations releasedThursday. From its polar orbit around Mars, the MGS probe found Mars Express first as the two spacecraft flew over the red planet on April 20. Separated from its orbital target by a distance of 155 miles (249 kilometers), the MGS probed turned its Mars Orbiter Camera lens toward the passing spacecraft to snap the first two images of a red planet orbiter. 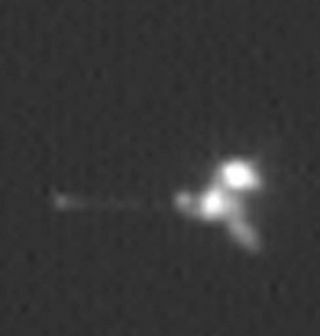 Because of the distance between MGS and Mars Express, the European orbiter appears as little more than a narrow blur in the final composite image. But astronomers analyzing the image said the Express probe appeared to be about 1.5 meters by 15 meters in dimensions, which is consistent with what they would expect from the MGS spacecraft's vantage point. Just one day after its Mars Express encounter, MGS found NASA's Mars Odyssey probe. Odyssey and the MGS spacecraft share similar near-polar orbits, sometimes passing within 9 miles (15 kilometers) of each other. Odyssey orbits higher than MGS to prevent collision. During the recent pass, MGS compiled two views of the Odyssey orbiter - in which a distinct spacecraft profile can be seen - in images taken 7.5 seconds apart. In the first view, MGS was just 56 miles away (90 kilometers) away from its NASA-built relative, but a few seconds later the two spacecraft were separated by about 84 miles (135 kilometers). Because of the additional distance, Odyssey appeared to move more slowly. Built by San Diego-based Malin Space ScienceSystems, the Mars Orbiter Camera has been a key tool for the for the MGSspacecraft, which entered orbit around the red planet in 1997. Mars Odysseyarrived at the planet in 2001, with Mars Express following suite in late 2003. From a distance of 62 miles, MGS'camera has a field of view 830 yards (758 meters) across, so any mismatch intiming during its orbiter photography would have yielded only blank space. Butthe orbiter managed to photograph its fellow red planet probes while all threecircled Mars at 7,000 miles an hour (11,265 kilometers an hour). The images of both Mars Express andMars Odyssey from the MGS probe were obtained by the Mars Global Surveyoroperations teams at Denver's Lockheed Martin Space System, as well as NASA'sJet Propulsion Laboratory and MalinSpace Science Systems.